Tea Cabin Quilt Collection from VHC Brands | P.C. Fallon Co. Turn your bedroom into a cozy, rustic retreat with the Tea Cabin quilt collection from VHC Brands. 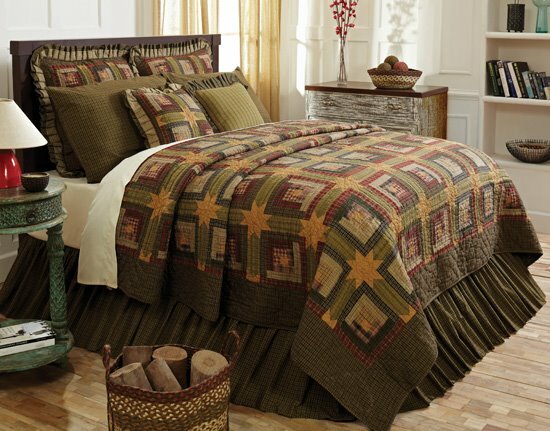 Part of the Lasting Impressions line, this ensemble is a fine example of a traditional log cabin block patchwork pattern separated by 8-point stars and green plaid sashing. Muted, earthy shades of green, gold and reds along with ruffles on the pillows and shams create a warm, inviting look that will feel at home with any decor. All fabrics are 100% woven cotton. The quilts are machine-pieced and hand-quilted. They are bordered in and reverse to a dark, moss green check. Because these fabrics have been "tea dyed," each piece features slight, natural color variations. The Tea Cabin collection also features a variety of window treatments, two decorative throws and a shower curtain. All throw pillows include inserts. Shams do not include pillow inserts. Machine wash, gentle cycle. Throw pillows and rugs spot clean only. From the Lasting Impressions line by VHC. Free shipping on all orders over $89. The Tea Cabin luxury king quilt set includes one luxury king quilt, two king shams and one king bedskirt. The quilt measures 120"W x 105"L and features a classic log cabin block design separated by green plaid sashing and tea-stain solid color 8-point stars. All fabrics are 100% cotton woven plaids. Quilt is machine-pieced, hand-quilted and made with cotton batting. Border, binding and reverse are in dark green plaid. The king shams each measure 21" x 37" and the bedskirt measures 80" x 78" with a 16" drop. These items are imported. Please note, colors may appear differently in different resolutions and on different computers. Machine wash, gentle cycle. From The Victorian Heart Collection made by VHC Brands. This Tea Cabin ruffled fabric pillow measures 16" x 16" excluding the ruffled flange. This pillow features a green and tan plaid fabric with flange in a different green plaid. Bias red plaid piping accents the base of the ruffle. Reverses to red, green and creme plaid. Button closure on the reverse has a 3" overlap to conceal the pillow insert. Pillow fabric is cotton, and pillow fill is polyester. This item is imported. Please note, colors may appear differently in different resolutions and on different computers. From The Victorian Heart Collection made by VHC Brands. Manufacturer's UPC code is 840528151163. This Tea Cabin valance measures 16" high including a 2" header and 72" wide. It is done in a medium and deep olive green plaid with creme highlights. This valance has a 3.25" rod pocket and comes lined in white cotton. The green plaid fabric in this valance also matches the bedskirts and the pillow cases also in the Tea Cabin collection. This item is imported. Please note, colors may appear differently in different resolutions and on different computers. From The Victorian Heart Collection made by VHC Brands. Manufacturer's UPC code is 840528130823. These Tea Cabin swags each measure 36" drop x 36" wide with a 2" header included in the overall measurement. Also features a 3.25" rod pocket. Green plaid in medium and deep olive green highlighted with creme. Fabric is 100% cotton and lined with white cotton. This fabric is the same used in the bedskirts and the pillow cases also in the Tea Cabin collection. Sold as a set of two swags (mirror images of each other). This item is imported. Please note, colors may appear differently in different resolutions and on different computers. From The Victorian Heart Collection made by VHC Brands. Manufacturer's UPC code is 840528130793. These Tea Cabin short panels measure 63"L x 36"W and are sold in sets of two panels, done in plaid in medium and deep olive green tones highlighted with creme. The panels are 100% cotton and are lined with white cotton. Tie-backs in matching fabric are also included. This is the same fabric used in the bedskirts and the pillow cases also in the Tea Cabin collection. The header measures 2” and is included in overall measurements. 3.25" rod pocket. This item is imported. Please note, colors may appear differently in different resolutions and on different computers. From The Victorian Heart Collection made by VHC Brands. Manufacturer's UPC code is 840528130830. These Tea Cabin tiers each measure 24"L x 36"W. Sold as a set of two panels in a plaid in medium and deep olive green tones, highlighted with creme. 100% cotton, lined with white lining. The header measures 2" and is included in the overall measurements. Also includes a 3.25" rod pocket. These green plaid tiers match the bedskirts and the pillow cases also in the Tea Cabin collection. This item is imported. Please note, colors may appear differently in different resolutions and on different computers. From The Victorian Heart Collection made by VHC Brands. Manufacturer's UPC code is 840528130816. These Tea Cabin tiers each measure 36"L x 36"W. Sold as a set of two panels in a plaid in medium and deep olive green tones, highlighted with creme. 100% cotton, lined with white lining. The header measures 2" and is included in the overall measurements. Also includes a 3.25" rod pocket. These green plaid tiers match the bedskirts and the pillow cases also in the Tea Cabin collection. This item is imported. Please note, colors may appear differently in different resolutions and on different computers. From The Victorian Heart Collection made by VHC Brands. Manufacturer's UPC code is 840528130809. The Tea Cabin Jute Rug Oval 20x30 brings rustic country appeal to your floor with variegated braids in brown, green, cream, russet burgundy, and natural. Measures 20" x 30". 100% braided jute. Spot clean only. This item is imported. Please note, colors may appear differently in different resolutions and on different computers. Made by VHC Brands. Manufacturer's UPC code is 841985083677. The Tea Cabin Jute Rug Rectangular 20x30 brings rustic country appeal to your floor with variegated braids in brown, green, cream, russet burgundy, and natural. Measures 20" x 30". 100% braided jute. Spot clean only. This item is imported. Please note, colors may appear differently in different resolutions and on different computers. Made by VHC Brands. Manufacturer's UPC code is 841985083684. The Tea Cabin Jute Rug Oval 24x36 brings rustic country appeal to your floor with variegated braids in brown, green, cream, russet burgundy, and natural. Measures 24" x 36". 100% braided jute. Spot clean only. This item is imported. Please note, colors may appear differently in different resolutions and on different computers. Made by VHC Brands. Manufacturer's UPC code is 841985083691. The Tea Cabin Jute Rug Rectangular 24x36 brings rustic country appeal to your floor with variegated braids in brown, green, cream, russet burgundy, and natural. Measures 24" x 36". 100% braided jute. Spot clean only. This item is imported. Please note, colors may appear differently in different resolutions and on different computers. Made by VHC Brands. Manufacturer's UPC code is 841985010741. The Tea Cabin Jute Rug Oval 27x48 brings rustic country appeal to your floor with variegated braids in brown, green, cream, russet burgundy, and natural. Measures 27" x 48". 100% braided jute. Spot clean only. This item is imported. Please note, colors may appear differently in different resolutions and on different computers. Made by VHC Brands. Manufacturer's UPC code is 841985083707. The Tea Cabin Jute Rug Rectangular 27x48 brings rustic country appeal to your floor with variegated braids in brown, green, cream, russet burgundy, and natural. Measures 27" x 48". 100% braided jute. Spot clean only. This item is imported. Please note, colors may appear differently in different resolutions and on different computers. Made by VHC Brands. Manufacturer's UPC code is 841985083714. The Tea Cabin Jute Rug Oval 36x60 brings rustic country appeal to your floor with variegated braids in brown, green, cream, russet burgundy, and natural. Measures 36" x 60". 100% braided jute. Spot clean only. This item is imported. Please note, colors may appear differently in different resolutions and on different computers. Made by VHC Brands. Manufacturer's UPC code is 841985083721. The Tea Cabin Jute Rug Oval 60x96 brings rustic country appeal to your floor with variegated braids in brown, green, cream, russet burgundy, and natural. Measures 60" x 96". 100% braided jute. Spot clean only. This item is imported. Please note, colors may appear differently in different resolutions and on different computers. Made by VHC Brands. Manufacturer's UPC code is 841985010796. The Tea Cabin Jute Rug Rectangular 60x96 brings rustic country appeal to your floor with variegated braids in brown, green, cream, russet burgundy, and natural. Measures 60" x 96". 100% braided jute. Spot clean only. This item is imported. Please note, colors may appear differently in different resolutions and on different computers. Made by VHC Brands. Manufacturer's UPC code is 841985010802.